Retreats offer a wonderful opportunity to put down your everyday responsibilities and duties, while joining like-minded people in cultivating mindfulness, concentration, and insight. During the course of a retreat, participants can deepen their mindfulness practice, learn new meditation techniques to facilitate healing and transformation, gain a better understanding of the Buddha's teachings and their own minds, and return home renewed and even transformed. FCM retreats are often designed to support current areas of study and practice within one of our three Paths of Practice: Mindful Living, Dharma, and Wisdom. See Upcoming Events below for a listing of upcoming FCM retreats. Most retreats include a daily Dharma talk, periods of guided sitting and walking meditation, mindful movements, deep sharing and deep listening, and solitary practice. 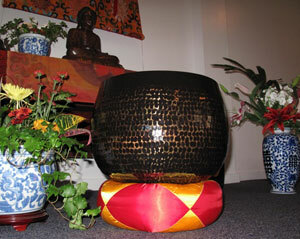 Retreats are enjoyed in noble silence, except for the times when the group gets together for sharing and discussion. Days of mindfulness are conducted typically as silent mini-retreats to encourage looking within, paying attention to our breath, and being mindful of the present moment. They provide an opportunity to spend an extended time in mindfulness, to practice sitting and walking meditation, enjoy nature, hear a Dharma talk and/or participate in a discussion. Sometimes, there is a longer opportunity to have questions answered, in an "Open Forum" format with our teacher. Please click here for more information about Days of Mindfulness and for a calendar of upcoming events. FCM's residential retreats typically last for three-to-seven days. FCM sponsors three different (three-to-four-day) retreats each year in Florida, one in the fall, one in the winter, and one in the spring. Fred also offers a seven-day retreat in June at the Southern Dharma Retreat Center in the mountains of North Carolina. With the opening of FCM's Great Cloud Refuge in early 2019, retreats at the Tampa Center will soon be offered on a monthly basis. Meals at retreats are vegetarian. Retreats that support a current area of FC study are typically open to FCM members only. Other retreats have more general themes and are open to all. If you wish to attend a restricted retreat please visit our membership page to learn how to become an FCM member. A limited number of scholarships are available for each retreat. Please click here for information and a retreat scholarship application. FCM also offers solitary retreats for members (please click here for more information). Registration for Retreats is generally available on the calendar listing below approximately 45 days prior to the retreat start date. Registration for Fred's retreats at Southern Dharma Retreat Center is done by Southern Dharma on their website (www.southerndharma.org), not through the FCM website, so please contact them directly.